Size of this preview: 717 × 600 pixels. Other resolution: 3,159 × 2,643 pixels. 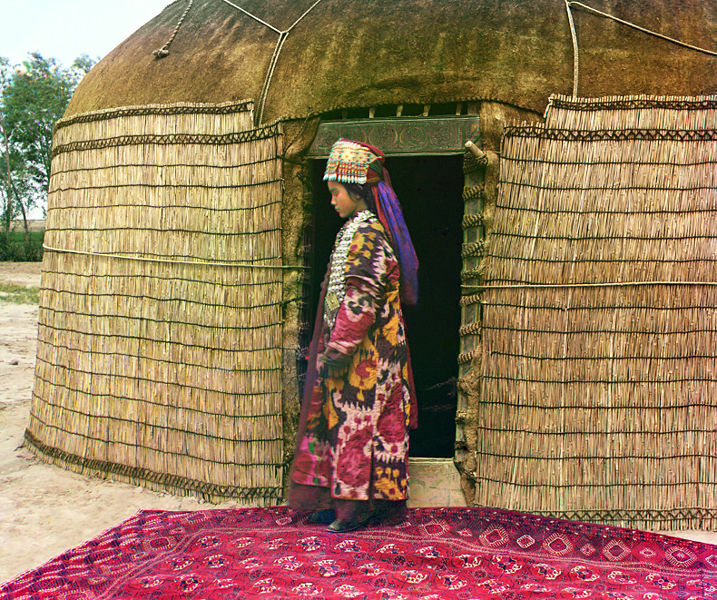 Original Description: Full-length profile portrait of Turkman woman, standing on a carpet at the entrance to a yurt, dressed in traditional clothing and jewelry. under the digital ID ppmsc.04412. There are no known restrictions on the use of this image. This work is in the public domain in Russia according to article 1281 of Book IV of the Civil Code of the Russian Federation No. 230-FZ of December 18, 2006 and article 6 of Law No. 231-FZ of the Russian Federation of December 18, 2006 (the Implementation Act for Book IV of the Civil Code of the Russian Federation). The author of this work died before January 1, 1945. The author of this work died between January 1, 1945 and January 1, 1949, did not work during the Great Patriotic War (Eastern Front of World War II) and did not participate in it. This work was originally published anonymously or under a pseudonym before January 1, 1943 and the name of the author did not become known during 50 years after publication. This work was originally published anonymously or under a pseudonym between January 1, 1943 and January 1, 1949, and the name of the author did not become known during 70 years after publication. This work is non-amateur cinema or television film (or shot, or fragment from it), which was first shown between January 1, 1929 and January 1, 1949. If the author of this work was subjected to repression and rehabilitated posthumously, countdown of copyright protection began not from the death date, but from the rehabilitation date. If the work was first published posthumously, the copyright term is counted from the date of that first publication, unless the author was later rehabilitated, in which case it runs again from that later rehabilitation date. Cinema films first shown before January 1, 1929 are subjects of points 1 and 2 of this template.